In the realm of organization, Google has added a few features to help you stay more organized. The "Move" and "Add to My Drive" functions have been added directly to the toolbar as you navigate your documents. You are also able to add files to any folder while previewing them. In addition, users are now able to drag/drop files into any folder from the search results screen. 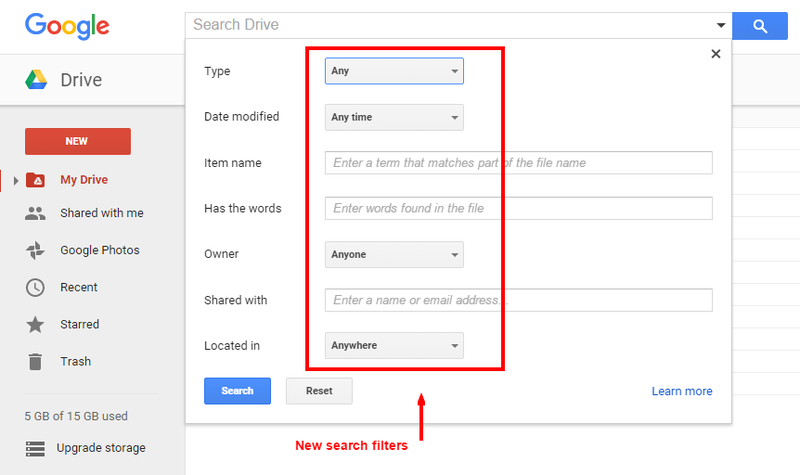 Searching within your Drive has gotten a whole lot easier with the additional search filters now available...check them out! The mobile applications have been tended to as well. Drive now allows for share notifications that will alert you of both share requests and notices. Calendar now gives the user the option of creating not only an event but also reminders for those little things that just don't warrant a full event entry. Reminders will work across the platform from Calendars to Inbox, Keep, and Google Now.